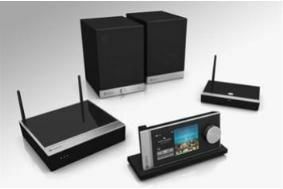 Raumfeld adds Last.fm to multiroom audio system | What Hi-Fi? We were bowled over by the 3Raumfeld system when it appeared in First Tests in our Awards issue and the company has now added the Last.fm service to the system. Customers will receive 30 days full access to Last.fm's streaming music service for free, after which a subscription fee will be required. Last.fm keeps track of what you play on your system (also known as scrobbling), learning as it goes and offering "highly customised music recommendations and individual radio stations". Add the Last.fm app to the Raumfeld controller to ensure it scrobbles every track the system plays. The latest software upgrade also includes playlist management, filing classing music by composer tag and enhanced third party UPnP/AV compatibility. For more information on the system and to buy products you'll need to go to the Raumfeld website. To read our review of the Raumfeld3 system, pick-up a copy of our Awards issue.